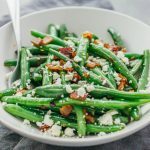 Make this delicious side dish: garlic green beans sauteed with crispy diced bacon and crumbled feta cheese. Boil green beans for 2 minutes. Drain and rinse with cold water for a minute. Set aside. Add diced bacon and shallot to a 3 quart or larger pan over medium heat. Cook until crispy, 10 to 15 minutes, stirring occasionally. Add green beans and minced garlic to the pan. Stir as you mix everything together, cooking for a few minutes. Serve and top with feta cheese.